It can be discouraging to hop on the scale and discover your weight has gone up a pound or two in the course of a day. But rest assured, it isn't really possible to gain this much weight -- in the form of fat -- in a day. What you're experiencing is most likely water weight gain, which can be caused by your fluid intake or a number of other things. It's normal for a person's weight to fluctuate by up to 4 pounds each day based on a number of factors. Weight goes up from fluid, salt and food consumption and may drop after trips to the bathroom and from sweat loss during exercise. This means your weight can change during the course of the day as well as from day to day. If you're working out in hope of gaining muscle, be aware most people gain only 1 to 2 pounds of muscle per month. It takes an extra 3,500 calories to gain 1 pound of fat, so if the scale shows you've gained multiple pounds quickly, it's probably mostly water weight and not fat or muscle gain. People who participated in a study published in the Journal of Human Nutrition and Dietetics in 2013 had weight fluctuations of around 1 to 4 percent of their body weight over the course of three days. That's the equivalent of 2 to 5 pounds for someone who weighs 150 pounds. Drinking two glasses of water can cause your weight to go up by about a pound, until your body has time to process it and excrete any fluid it doesn't need. You're more likely to notice this extra weight if you drink a lot of water at once and then get right on the scale than if you spread your water intake more evenly throughout the day. Don't avoid drinking water because you're worried about water weight gain; that plan will have the opposite effect of what you're hoping for. If you become dehydrated, your body holds on to extra water -- by urinating less frequently, for instance -- which can cause temporary increases in water weight. Increasing the amount of water you drink can cause your body to release this extra water, and you drop the water weight. There's even evidence that drinking enough water helps with weight loss. Study subjects who increased their water intake lost more body fat over a 12-month period than those who didn't drink more water, according to research published in Obesity in 2008. Hormonal changes in women can cause water weight fluctuations during the course of the month. Consuming a lot of salty foods and not getting enough exercise can both cause you to retain more water, And although it seems counterintuitive, so can working out regularly, says professor of exercise science Michele Olson in Fitness Magazine. When your body is used to regular workouts, it may hold onto more water to limit the risk of dehydration. 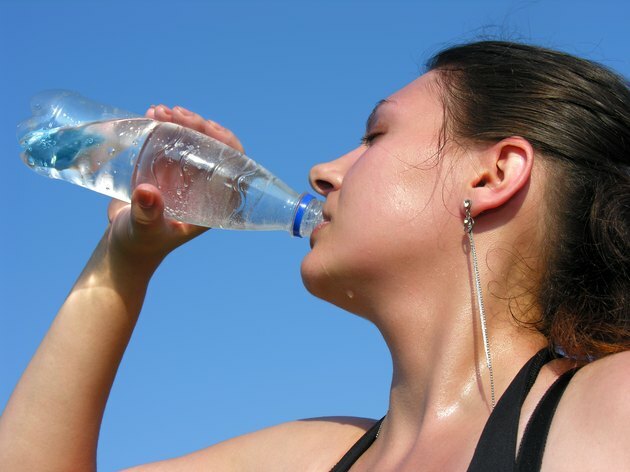 Sweating due to a hard workout or hot weather can decrease your weight temporarily until you replace the lost water. When you're constipated, your body takes longer to process the food you've eaten, which temporarily increases your weight as well. Weighing yourself under the right circumstances can help you get a more accurate picture of whether you're gaining or losing weight. Step on the scale first thing in the morning -- but after you've urinated -- wearing about the same amount of clothing. Even better, weigh yourself once a week on the same day of the week for a month and average the weights. Compare this number to your starting weight and the next month's average weight to get a fairly accurate idea of whether your weight is going up or down. CNN: How Is It Possible for My Weight to Fluctuate So Much? Consumer Reports: Q&amp;A: Are Short-Term Weight Fluctuations Normal?